It’s official! I am finding my way back in to the kitchen again! Flicking through one of my latest cook books, I thought there was no better way than to start off with some fairly straight-forward burgers. There’s a recipe for this and it comes from Jamie Oliver’s Ministry of Food – a belated birthday blessing from one of my closest friends. Let’s see how I got on! An initial reaction to this book is that I enjoy its layout with the near step-by-step photos to accompany each meal – something sorely lacking from some of the other books I’ve been using. 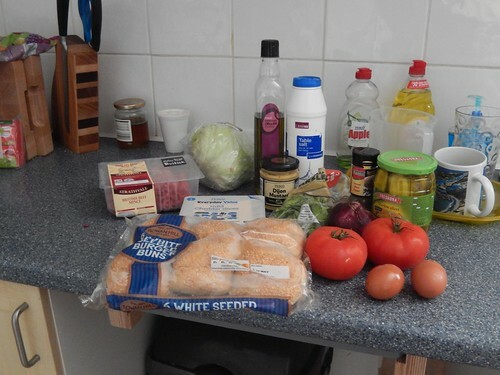 I was pleased that I was able to obtain most of the necessary ingredients from my local Lidl. Several items were already stocked-up within my cupboards. Perhaps the only surprise absentee from the low-cost supermarket shelves was a skinny jar of cinnamon, for which I had to go elsewhere (but then again, that’s not relevant to this recipe). I also made an effort to try and find larger burger buns in a different store but to no avail (who really needs sesame seeds?). 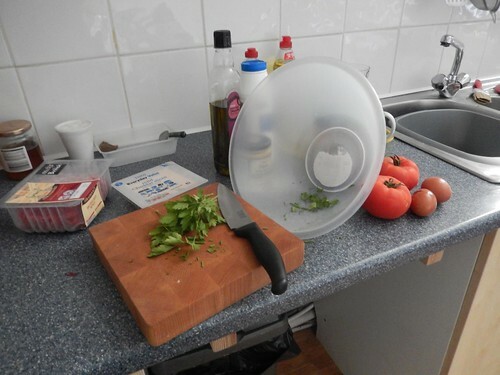 I started by chopping up the parsley. It seemed to simple. What could possibly go wrong? Yet, I had to position my largest mixing bowl so as to capture the many ends of the stalks as I chopped away with my knife. 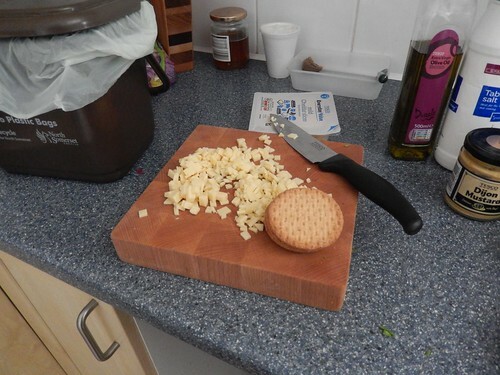 Jamie’s recipe calls for the introduction of Jacob’s cream crackers… You’re not going to believe me when I tell you that I trawled every isle of two supermarkets, only to depart without them!! So instead, I made a substitution by adding a pack of cheese slices to my trolley and knowing that I had a pack of unopened Digestives at home. 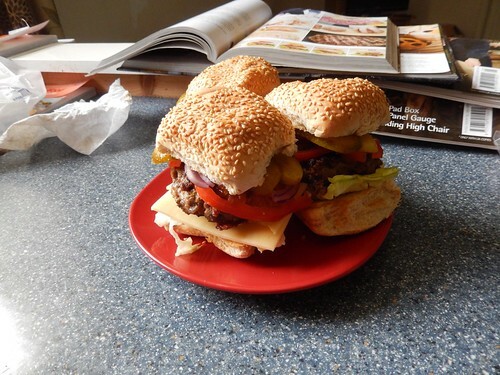 I also decided that I could add an extra slice of cheese inside the bun(s), if so desired, later on. 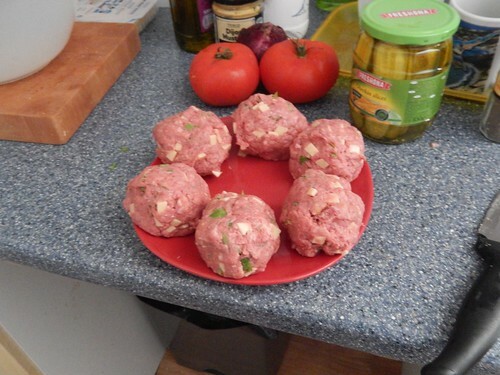 Eventually, the burgers were mixed up with some mince, in to the balls you can see above (yes, I had no idea that you had to make balls before forming burgers). As they made a heading for the frying pan, I prepared and set aside the toppings (also, I didn’t see any sea salt on the shelves and so, I’ve made do with table salt… Salt is salt, right?). Acting upon my own authority, I added a table spoon of olive oil to the pan ahead of the burgers. 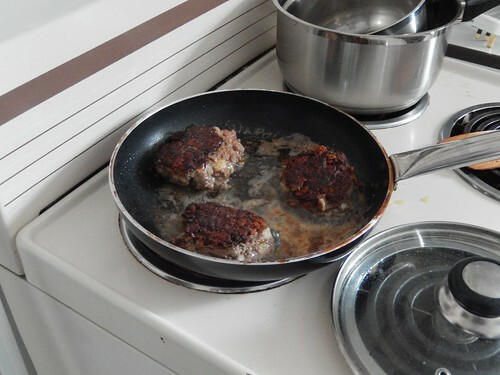 All this seemed to do was to create a lot of hissing, smoke and I’m quite certain it prolonged the cooking of the meat (you have to press them down in to a flat more-burger-like shape). 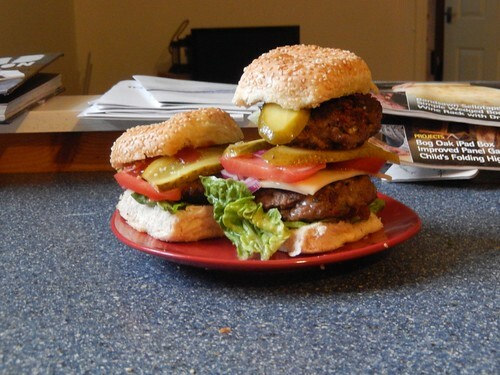 When tasting time arrived and, with 3 burgers cooked; I decided to attempt ‘a McDonalds’ by stacking two of the high within a single bun… But it was jaw-breakingly high! As I opened my mouth in a vain attempt at consumption, half of the contents slipped out the back and returned to my plate. As for the other; that was far easier to enjoy. My only concern was that I hadn’t perhaps pressed the burger flat enough. 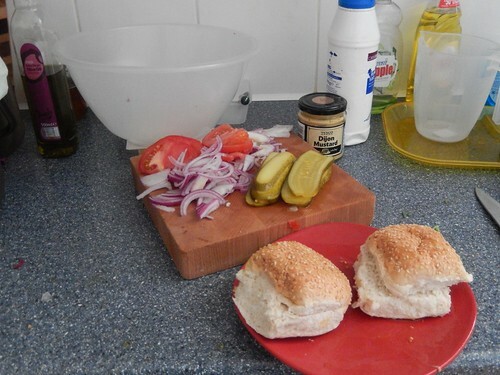 That and how these bread rolls were deceptively small, in my opinion. Kid’s size, really! But I had no idea I liked gherkins so much. I’d always assumed that flavour was down to the mustard! 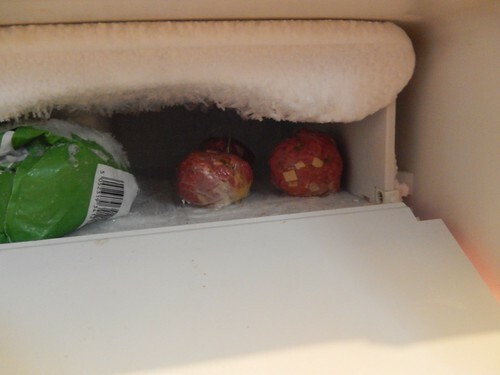 With three balls still to spare, I took Jamie’s advice, grabbed some cling film and wrapped them for frozen preservation. This was all last Friday. Before consumption this evening (6 days later), I allowed them to defrost in the fridge for 24 hours before cooking (a step I too often forget when cooking intending to cook mince). Tonight, I’ve enjoyed three good burgers in one sitting. Next time, I’ll cook them in pairs, freezing the rest for subsequent weeks. I’d also like to hunt down some of those elusive crackers to see what these may really taste like! Another option is to purchase a griddle pan for frying but, looking at some of the recipes I have planned ahead, I should apparently be looking to invest in a food mixer of some sort. Try Chipotle Turkey Club Sandwiches..
“But it was jaw-breakingly high!” LOL – that is a monster size burger.